I really like wood furniture and have a few antique pieces. From time to time I clean and polish it to keep the wood in good condition. Wood can dry out and age prematurely if not properly cared for and this becomes a greater concern when you are talking about a piece of furniture that is several decades old. I was thrilled to read about an easy, natural wood furniture polish you can make at home in my Healthy Child Healthy World book. I've read the ingredients on the bottle of stuff I typically use and it's not all safe. Combine two cups olive oil and one juiced lemon in a glass or ceramic container. Apply to furniture with a soft polishing cloth; rub briskly to shine. Allow furniture to dry. This is best used on furniture with an oily, rather than glossy finish. Test a small section of your piece of furniture before using it on the whole thing. How easy is that! 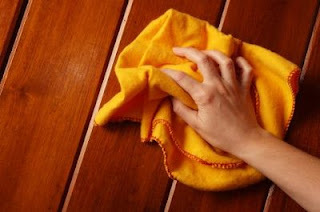 I usually wash my wood furniture really well with a mild soap like castile before I polish it to get all the dust and fingerprints off. Try out this great polish and admire your beautifully polished furniture without a trace of toxic chemicals. That looks great! Spacify offers wide range of Solid Wood Furniture . Discount furniture stores online, a selection of cheap online discounted home furniture and home decor accessories.